Since centuries business cards have been serving us in dealing with business matters. It may be the look that keeps changing or modified but one thing is constant i.e. it's effect on business. 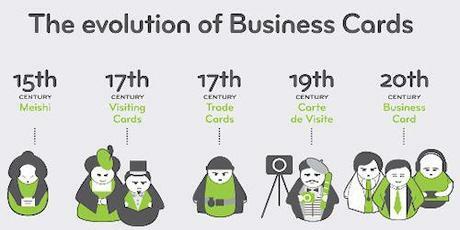 Here is a nice infographic by Moo, which will show the evolution of business cards from 15th century until now. Business cards are cards bearing business information about a company or individual. They are shared during formal introductions as a convenience and a memory aid. A business card typically includes the giver's name, company affiliation and contact information.